Storyboards can be the perfect way to communicate your cinematic ideas. But every once in a while, presentations need that extra power that only animatics can bring. Early sketches are often the first steps in bringing a script to life. They help filmmakers, TV producers and advertisers plan what a story will look like on the screen. Putting your storyboards into motion not only establishes your shots but also helps set timing, mood, and pace when you layer in music,sound fx) to sequences. Jane Wu has worked on some of the biggest action movies released in recent years including: Spider-Man: Into the Spider-Verse; Thor: Ragnarok and Game of Thrones. Take a look at Jane Wu’s storyboards for ‘The Mummy.’ Her work shows scenes and sequences in motion in a stunning animatic which give you a real feel for the scenes and how they will play out when photographed or fully rendered. When you need to create super-powered animatics, look no further than PowerProduction Software’s StoryBoard Artist pro storyboard software. As you create each board, the animatic is being created in the Timeline. Ready for you to set frame durations, add music / sound tracks, transitions and create motion graphics like Pan & Zoom. a/k/a Ken Burns effect. No doubt, Jane Wu is an amazing artist. But with StoryBoard Artist digital storyboard software you don’t need to have “pen on paper” talent to deliver a stunning presentation. 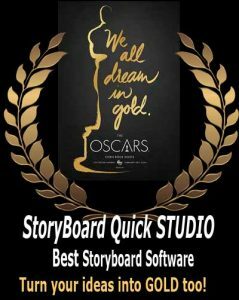 StoryBoard Artist animatic storyboard software comes with a ton of built-in artwork which can be helpful when creating your high-powered presentations. On the other hand, if you can draw like Jane, we’ve got you covered too! StoryBoard Artist Studio’s Edition come complete with Paint Layer and Draw Tools. So whether you work a 30-second commercial or the next Super Hero Blockbuster, consider creating an animatic. It’ll add a little punch to your pitch! Go ahead, check out our StoryBoard Artist page! Finally, check out Jane Wu’s website for more examples of animatics and static storyboards. Yes, there was no sound attached to the Jane Wu animatic but it is possible to add sound when creating your own animatic project (Using StoryBoard Artist 5.1 you can add sound to the animatics and export for online viewing).